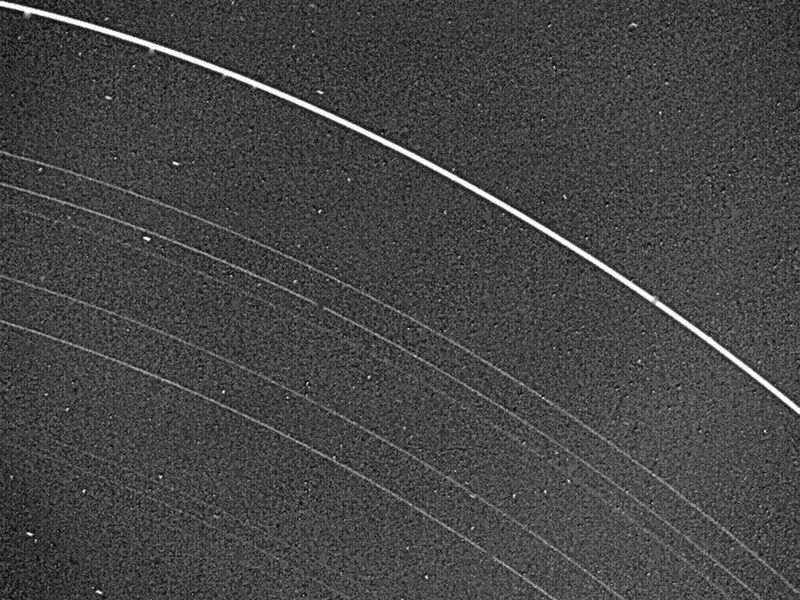 Voyager 2 returned this picture of the Uranus rings on Jan. 22, 1986, from a distance of 2.52 million kilometers (1.56 million miles). 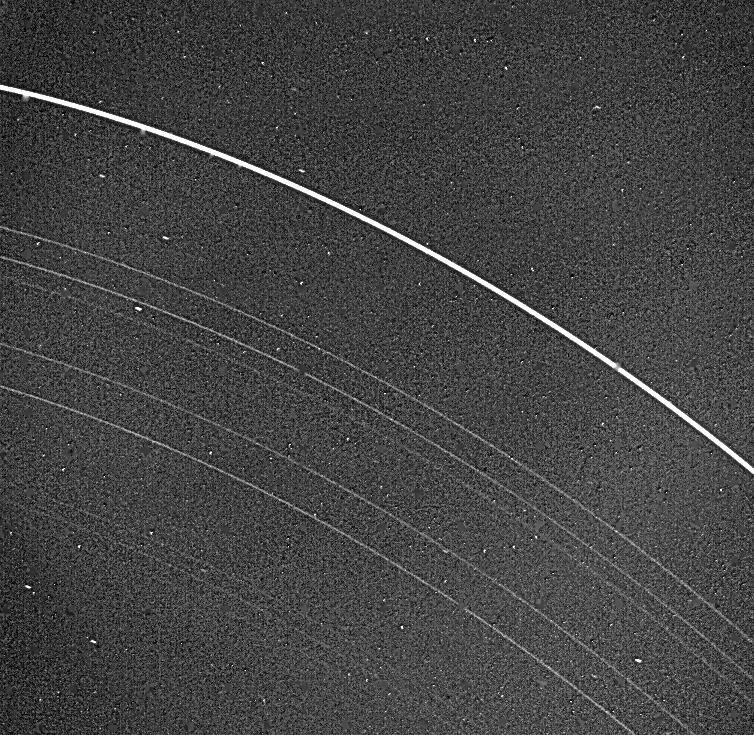 All nine known rings are visible in this image, a 15-second exposure through the clear filter on Voyager's narrow-angle camera. The rings are quite dark and very narrow. The most prominent and outermost of the nine, called epsilon, is seen at top. The next three in toward Uranus -- called delta, gamma and eta -- are much fainter and more narrow than the epsilon ring. Then come the beta and alpha rings and finally the innermost grouping, known simply as the 4, 5 and 6 rings. 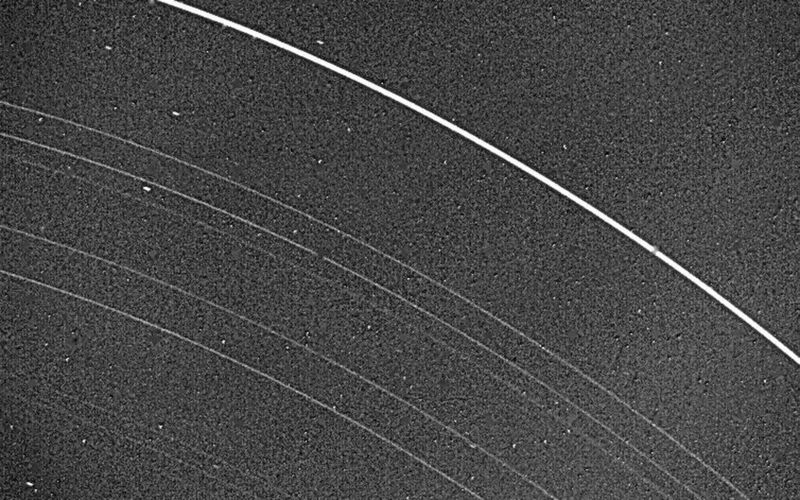 The last three are very faint and are at the limit of detection for the Voyager camera. Uranus' rings range in width from about 100 km (60 mi) at the widest part of the epsilon ring to only a few kilometers for most of the others. This image was processed to enhance these narrow features; the bright dots are imperfections on the camera detector. The resolution scale is approximately 50 km (30 mi). The Voyager project is managed for NASA by the Jet Propulsion Laboratory. This view from NASA's Cassini spacecraft features a blue planet, Uranus, imaged by Cassini for the first time. Uranus is a pale blue in this natural color image because its visible atmosphere contains methane gas and few aerosols or clouds. A recent NASA Hubble Space Telescope view reveals Uranus surrounded by its four major rings and by 10 of its 17 known satellites. 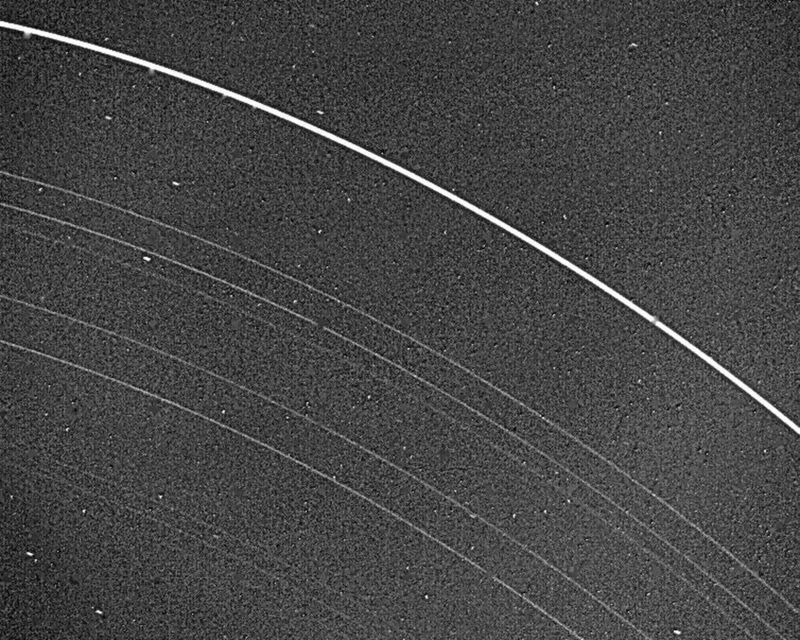 This picture is part of NASA's Voyager 2 imaging sequence of Ariel, a moon of Uranus taken on January 24, 1986. The complexity of Ariel's surface indicates that a variety of geologic processes have occurred.